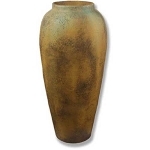 Large floor vases and table vases. Unique and unusual vases. Wood - Glass - Metal vases for the home and office. Also vase sets that look great in pairs or sets of three. See our “Raku Vases” page. For some very unique and one of a kind Vases.